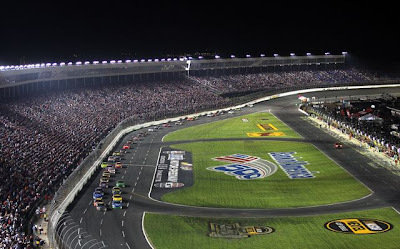 The Bank of America 500 is this Saturday at Lowe's Motor Speedway and there's a lot going on in Charlotte this week surrounding the race. Many activities start today. If you're a NASCAR fan, you'll have several opportunities to see drivers up close. If you're not a fan or don't know much about racing, here's your chance to see what all the fuss is about. ThatsRacin.com has compiled a great list of race week events and driver appearances. Click here. Lowe's Motor Speedway's website has the official fan guide. (Jessica Simpson will perform a 40-minute pre-race concert.) Click here. And finally, the October issue of Charlotte magazine, on newsstands now, features a great photo essay by Chris Edwards that is made up of photos from last year's Bank of America 500. Click here.